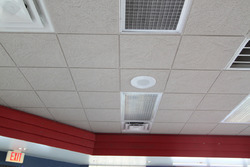 Providing you the best range of texture ceiling with effective & timely delivery. We are a leading manufacturer of TEX Ceiling.We are one of the prominent business firms engrossed in Manufacturing, a wide consignment of products including Acoustical Boards and Fabric Panel, Ready Mixed Cement Sand Plaster, Block Jointing Mortar, Tile Adhesive, Wall Putty. In conformity with the norms and quality values defined by the industry, these could be purchased from us at highly reasonable costs. More to this, their wide usage in the construction sector makes these products a preferred market choice. Made using top class components along with modern tools and tackles, these are widely acclaimed for their purity, effectiveness, reliability and efficiency.